That day, I knew my life would change. 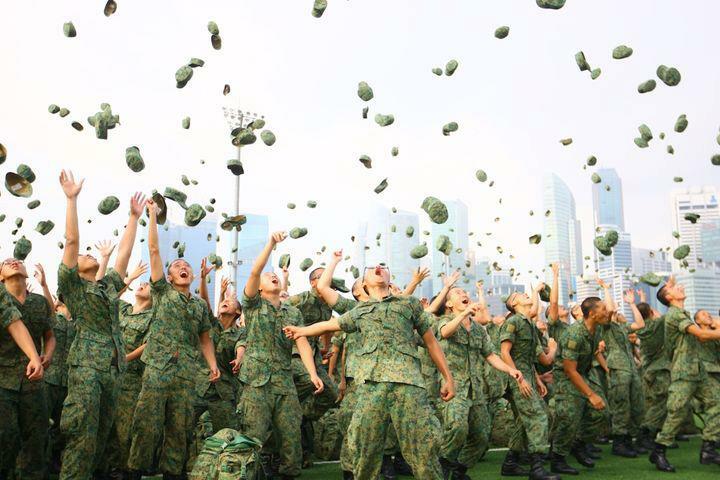 If you’ve gone through national service, you would know how people going into it would have felt. The shuffling of feet, whispers telling their partners how much they were going to be missed - these I did not imagine. I was there. I dreaded it, and dragged my feet into the interchange. It was melodramatic. Just like that local movie, we took the ferry onto the island. Swore our lives into potentially fatal allegiance, clearly not knowing what was going to happen. We left the dining area, formed up in neat rows, and turned around to look at our loved ones waving back. Till now, everyone’s journey was the same, equally pathetic. But mine was about to be different. My group took a long detour around the area and proceeded into our cluster. I barely had time to note the large letter “T” hanging on the wall before we were screamed at to face the floor, push the Earth. This is it, this is what the military is. We were instructed to do many things which were simple, if only because it was simple to just follow instructions. I missed home immediately, but I thought I could quickly adapt. I was ready. Unclear what’s going to happen, I waited for my name to be called. ‘As you are overweight, we have to remove you from BMT and recourse you. Here’s your status, PES D (temporary pes) and you will be put Out Of Training (OOT).’ I wouldn’t say I am a smart man, so I didn’t argue or ask much. I was stumped. That seemed no different from what we were already doing here. Being new to the Army I didn’t (dare) ask further. I packed my belongings again after taking everything out on the first day. My sergeant shook my hand and said ‘ORD LO’. I spent the next two weeks in the HQ, basically not doing anything but watering plants, playing table tennis and sleeping. Reporting to camp at 8, waiting for lunch at 12, dying to go back at 5. Some people loved it, I didn’t. The next Monday we received our posting orders - we were finally getting out of there! On mine, the letters “DVR” were printed. I was excited for a while, thinking that they somehow sent me to the divers. Maybe a heavier person dives faster. I made great friends during my driving course and got posted to Nee Soon Camp. There, days were long and nights were short. I learnt a great deal. But eventually I asked my Motor Transport Officer, the officer in charge, to send me back to BMT. I think he laughed, but he was extremely efficient. By next month I was in an obese company. Those were the best days of my army life. I fought and worked hard, making sure that my performance would guarantee me a place in command school. I achieved the Platoon Best award. I treasured my remaining time with my BMT mates because I knew that after our final 24km we would all march down different, diverging paths. We tossed our caps and split our ways. A week later, the manpower department called me. They told me, me, that I was selected for OCS. But I needed to extend my service. OCS was difficult. I wasn’t a very fit and strong person despite my size. All I had was the determination to work hard. But I wasn’t someone who was outgoing and outspoken, the sort usually thought of as ‘leaders’. My OCS journey was a tad tougher and longer to me as compared to the rest. Having been hit by a knee injury in the early phase of my cadet term, trying to be physically capable as my stronger peers and trying to crack my brains on how to complete the detailed planning of a battle were serious obstacles for me. Still, I needed to complete this course. Every night, misery and worry hid behind my smile. Sometimes I would ask myself if it was worth all this trouble – why should I go through all these difficulty? Why not just serve these 2 years and end it quick? But I looked around me and I knew that, whatever difficulties I was facing, I wasn’t the only one. I made it to the 18th of April, commissioning day. Tossing my peak cap was a lot like tossing my jockey cap. There was an inexplicable euphoria accompanied by a deep-seated sadness, rooted in the knowledge that the band of brothers I fought with in OCS will be embarking onto different command lives very soon. I realized how cruel reality can be and how constant change can be. But I knew that we have to adapt to changes to be stronger. Now here I am - just disrupted my service to study - and I still feel that all that trouble was worth it. Enlisted, September 11, 2013. Removed from BMT 3 days later. Driving Course, November 2013. Recoursed BMT, February 21, 2014. Commissioned, April 18, 2015.I hope my story can inspire future batches. Because if we, this generation, don’t know why we must defend, then those after us have a thousand more reasons to argue why we don’t. To those who are facing difficulties and hardship, never, never, never ever give up. Life isn’t about waiting for the storm to pass, it’s about learning how to dance in the rain.